Welcome to the Tiger Swag, a website dedicated to bringing unique content and takes on all things Clemson. Here we will esteem those worthy of esteeming, ponder that which needs pondering, question everything, and above all - laugh. At others. At ourselves. And most of all, at our rival. 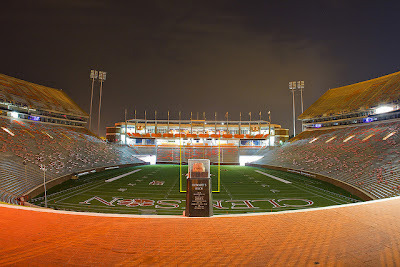 There are many great Clemson sites around offering insider access, message boards, and daily news. This site will not be one of them. Here you will find a safe haven. Instead of arguments, you will find laughter. Instead of anger, humor. Instead of worry, peace. This will be a place to remember what makes Clemson special and why you first donned the orange. And how thankful you are not to be a Gamecock or Dawg or Jacket or Heel. Like many of you, this university holds a special in place in my heart. As a third generation Tiger, I know what it means to grow up in a loving, orange family. And I know what it is to follow proudly in the footsteps of others. My first memory of Death Valley was in the midst of the great Clemson-UGA games of the early '80s. We had just scored and 80,000 people were singing Tiger Rag. While standing on the aluminum bleachers in section UG, waving my arm in circles for the "O" and waiting for the "N", a Georgia fan tried to sneak passed. Unfortunately for him, he came in my zone at the same time of the last cymbal crash. I popped him. Solidly. Not intentionally, of course. But it happened. And I was hooked. As Clemson fans, we hold memories dear and traditions in high regards. And hopefully the Tiger Swag can find a place in your heart, somewhere between the Tiger Shag and the Tiger Rag. Please check us out, drop us line, and let us know how you're doing. And if so inclined, how we're doing. You can reach us by email at thetigerswag@gmail.com, twitter at http://twitter.com/#!/thetigerswag, and facebook at http://facebook.com/thetigerswag. Also, please check out our <uglier> sister site, http://cockabooster.com.